9x12, xvi + 109 pp. Fortunato Chelleri (ca. 1690–1757) began his career as an opera composer in Venice, but for most of his professional life he found employment as kapellmeister at various Northern European courts. He travelled to Venice, Barcelona, Würzburg, Kassel, London, Düsseldorf, Florence, and Stockholm, and his associates included Vivaldi, Agrell, Sandoni, Platti, Ariosti, Cuzzoni, and Pilotti. 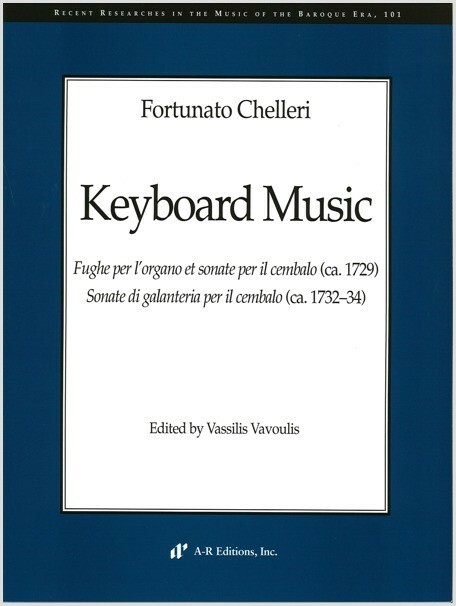 Chelleri's considerable corpus of instrumental music shows evident signs of cosmopolitanism, and the harpsichord sonatas presented in this edition combine elements of the suite-based works of both the French clavecinistes and the German keyboard composers. At the same time, his music is also very much characterised by the italianate spirit of the galanti composers who were to be the next phase in harpsichord music. Chelleri's best moments may be looked for in the intimate Andantes, the often volatile Gigas, and, not least, in the eight elegant Minuets and their interplay of gesture and repetition.